The importance for the reliable operation of transportation systems lies heavily upon effective communications and security systems. Whether travelling during the day, alone, or at night, it is important for passengers and staff to feel safe and secure when using transportation systems. Jacques’ Integrated IP Communications System featuring intercom, help point units and public address, provides a flexible and reliable package with integration to many third party systems and devices, including CCTV, security management and access control systems. Jacques provides unique and individual solutions that work effectively for bus, train, airport and maritime transportation systems. Transportation systems will be able to avoid delays and effectively manage any security issues to ultimately satisfy consumer demands. A bus or rail network PA system enables simple notification to passengers regarding safety warnings, delays or emergency broadcasts within multiple zones, pre-recorded messaging, scheduled release of messages, background music and distribution of information. Either, broadcasting announcements to all stations simultaneously or announcing specific messages to nominated stations (zones) are guaranteed to be clear and consistent at each station regardless of the distance or location. Help Points can be positioned at each station and on train carriages, allowing for passengers to make emergency calls or listen to passenger information. The most effective way to ensure problems are dealt with efficiently and traffic can keep moving is with a Jacques IP Communication System, featuring Emergency Help Point Units (HPU). They feature highly visible, vandal and water resistant enclosures, with one-touch operation and hands free communication. Similarly, bollard intercoms positioned at tolling booths and integration to CCTV and access control systems, drivers have the ability to contact assistance through user-friendly intercom terminals. Whilst security personnel are able to verbally address drivers, view the situation via CCTV and allow through access from a central control location, reducing disruption to traffic flow. Tunnels increase the risk for driver safety due to the dangers of minimised visibility, minimal exit points and poor lighting thus enhancing the need for advanced and comprehensive security services. Jacques offers PA systems, HPUs and intercoms for installation throughout tunnels to ensure drivers are able to contact help immediately and receive prompt assistance. 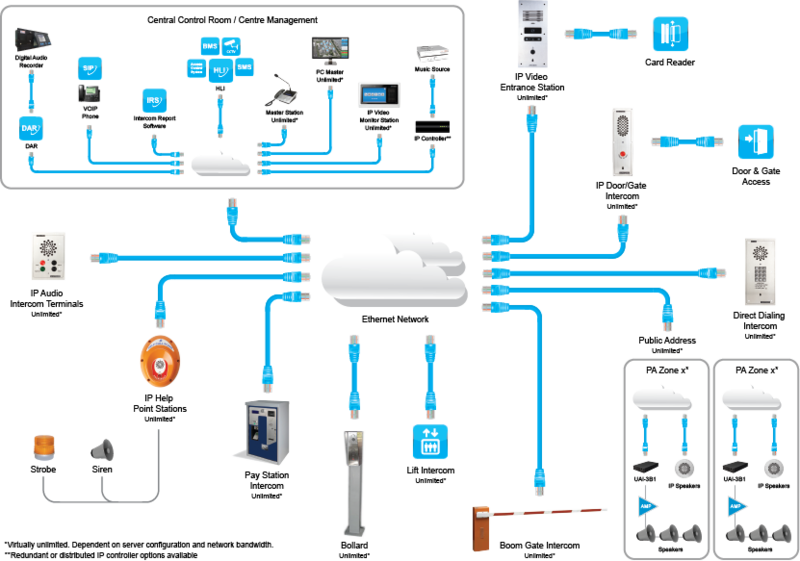 Jacques IP communication systems integrate via high level interface to a large number of industry recognised partners. Integration with building and security, CCTV, telephony and access control systems ensure a complete security solution. Third party IP CCTV camera associations via high level interface allows for CCTV switching to occur when an intercom terminal is in use, allowing for complete audio/video control. Jacques IP intercom & PA system for transport network applications can be easily managed through the Jacques customised Graphical User Interface (GUI). The GUI, specifically customised for each site provides central control staff with one touch operation of the intercom and Public Address system. Multiple map views provide users with a visual representation of the site and it’s intercom/PA endpoints. The Jacques PA system allows for multi-zone, pre-recorded message, scheduled release of messages and distribution of information in a timely manner. This makes efficient notification to passengers simple. In a case of notifying commuters that service 148 is running five minutes late, broadcasts can be selectively announced at only associated stops. The system also allows for pre-recorded messages with scheduled announcements at all or selected stations. Jacques facilitates the capture of audio from any and all intercom call/s in the system. The system provides multiple simultaneous digital channel outputs for digital voice logging with time date stamping, ideal for investigating issues of public safety within transport networks. Transport networks depend on system reliability. Jacques systems featuring redundant and distributor server frameworks that limit single points of failure, ensuring system robustness and site-wide reliability. 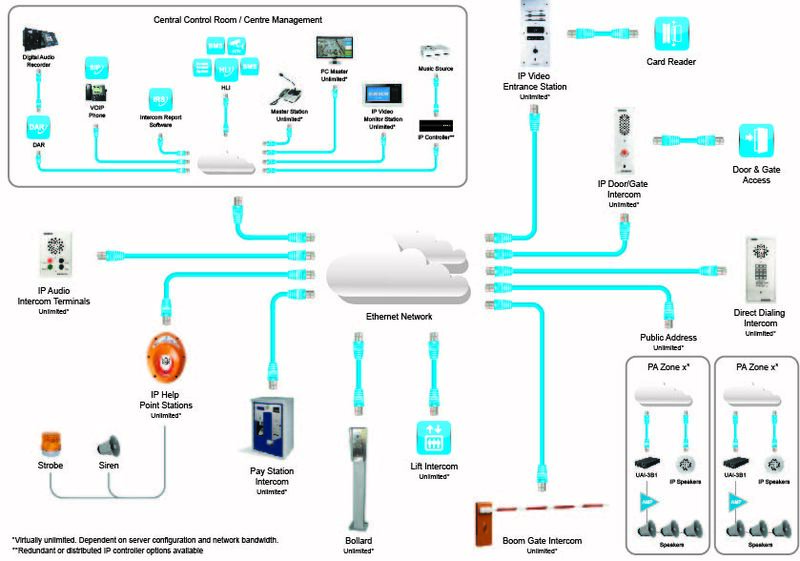 Ability for multi sites (multi stations across a transport network) to be controlled from a central management center. Sites can be linked via Wide Area Network (WAN). In an airport application, a Jacques IP Communication System will ensure easy and steady management of airport security and communications through help points, intercom terminals, public address and car park intercoms. Passenger and staff safety is also increased through full integration of access control, building and security management, CCTV and ticketing machines. Passengers seeking flight assistance or even emergency call assistance can access help points and intercom stations positioned throughout airport terminals and car parks. Jacques IP communication system for the maritime industry protects vessels and people through integrated IP intercom terminals, public address and access control which can all be monitored from one central or remote location. If an incident arises, security can visually monitor the area through integrated third party CCTV cameras and provide emergency warning and evacuation information to those affected through the public address system. Jacques vandal and weather resistant intercoms can be positioned on docks, near loading bays or within cranes, ensuring port personnel have communication access to central control at all times. Seamless integration with access control and CCTV systems ensures doors and gates can be opened to wanted visitors and staff, following the establishment of communication via intercom.